Paving the way to officially hand power to electronic overlords? President Obama today presented IBM and its Blue Gene family of supercomputers with the National Medal of Technology and Innovation. The Medal is the highest honour for technological achievement in America, and was created in 1980 to encourage innovation and competitiveness. One of the first recipients of the Medal (in 1985) was Apple founder Steve Jobs, and other notable winners have included Bill Gates, HP's David Packard, Gordon Moore (of Moore's Law fame) and sound supremo Ray Dolby. Earning the Medal is no guarantee of future success, however. Year 2000 winner Dean Kamen went on to launch the much-derided Segway Transporter, the dominance of 1988 recipient Edwin Land's Polaroid company crumbled in the face of digital photography and, although 2006's Ralph Baer did invent the world's first video game, he's best remembered these days for light-up memory game Simon. IBM has earned the National Medal of Technology and Innovation on seven other occasions. 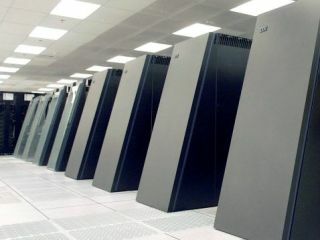 This time, it's for the Blue Gene supercomputers that have helped map the human genome, investigate medical therapies, design nuclear weapons, simulate radioactive decay and predict climate trends. President Obama will personally bestow the award at a special White House ceremony on October 7.